Les Burt is a local crab and lobster fisherman. He starts his day at 5am every morning and heads out to his first string of pots. 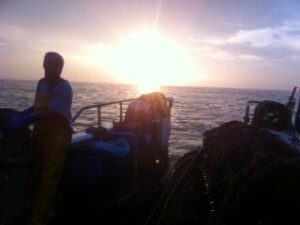 Les returns to shore at 3pm with his catch of spider crabs, chancres and lobsters. 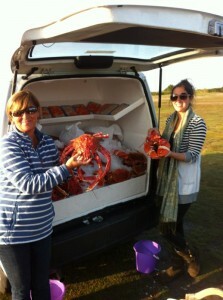 After taking part in a car boot sale at Corbiere, Les’ family had the idea to set up a shell fish van and sell his freshly caught seafood direct to customers. This has proved to be very popular, and the Burt family can be found at Corbiere on most Saturdays from March until September with a selection of freshly caught shellfish. They also sell freshly picked crab meat which is one of their most popular products. Some of Les’ catch is destined for various fish merchants around the island including Aqua-Mar Fisheries and The Fresh Fish Company.